It is the end of summer, 1989. Alois Nebel works as a train dispatcher at a small railway station in the Sudetenland, a mountainous region on the Czechoslovak border. He is a loner who prefers old timetables to people, and he finds the loneliness of the station tranquil – except when the fog rolls in. Then he hallucinates, seeing ghosts and shadows from the dark past of this region where after WWII harsh revenge was exacted on the German population. Alois cannot get rid of these nightmares and he eventually ends up in a sanatorium. There he gets to know The Mute, a mysterious man carrying an old photograph who was arrested by the police after crossing the border. Alois gets better and leaves the sanatorium. He decides to go to the Prague railway headquarters to seek help. There he finds the love of his life, Květa the toilet custodian, and returns to the mountains to meet The Mute and fight the ghosts which have been haunting him for so long. The scriptwriter Jaromir 99 (co-author of the graphic novel) and I have known each other since before he started drawing the comic. He was born and lived where the action takes place, and I had directed a clip for the group Priessnitz, so he helped out since he used to be a singer. So we had worked together before. Then Jaromir 99 and Jaroslav Rudis directed the first volume of the comic. Noone thought it could become a film. But it has had great success. It was the first cartoon for adults published in Czechoslovakia. From this success came the next two volumes. So the trilogy was born, it can now also be found in Poland and Germany. The producers read the whole thing and asked the authors if they wanted to make an adaptation for cinema. I didn’t know any producers myself. They were looking for a director and I had started to work on the story board. I was finishing my studies at FAMU, the film school in Prague. I brought up the subject and was offered the role of director and screenwriter. We didn’t know what methods we were going to use. We planned to make an animated version. At the time, a really good adaptation of Sin City was on the TV. It was with this in mind that we started working. Since the film was made with the authors of the comic, we had to keep the same style. Is it still your film? I’m a beginner, I’m not the author of the comic strip. I wanted to be of service to the writers who are from Sudetenland, where the action takes place. I tried keep their intentions in mind, and at the same time, there is a big evolution. For example, I made many changes to the characters. The hero was like a character from Bohumil Hrabal who comments on everything that happens. In the film, we tried to understand the mentality of the people who lived in the region, even if I tried to find actors who looked like the original characters. It’s important to understand that. For me, it’s the first time that those I work with are my schoolmates. It’s also a first film for Jaromir 99, and for Jaroslav Rudis, it’s the second one. You must also understand that rotoscopie, a technique which involves getting the outline of a filmed figure with real filming, is so new in this country that it’s the first time it has been used. When I was at school, I was closer to the Czech animation school, even if now I’m closer to fiction films. It’s my first experience with actors. I’ll still always be influenced by animation films. As for the Rotoscopie, it’s more difficult than we thought. If we had known what it involved, we wouldn’t have made the film. Call it beginner’s naiveté. For me, the most difficult thing was to decide what were the most important things for a scene. Now, it’s your turn to decide. It took a long time to reflect on every detail for every shot. I made some bad decisions. We had to go back on what we had already done. We could decide if it was raining or snowing, what wonderful freedom, but then freedom can be so restrictive! I prefer simple solutions. It’s like in Czechoslovakia: freedom complicates our lives (laughter). We did tests, there was a story-board, all was settled. The first editing made the film 110 minutes long, at the end we got down to 85. Let’s take an example. We shot one scene in a night shelter, where two people are alone at night, but during the filming it was daytime, and open to the public as well, so there were many people. It wasn’t until later that we decided it would be a night time scene and that they would be alone. Everything in one decision, that’s what makes this film. So did it take a long time? Five years altogether, two and a half for the animation and the rotoscopie, forty days for filming, then the rest for editing and six months for the sound. I’m very happy that we finished, that we bore through it. The German word „Nebel“ means „Fog“ in Czech. If read backwards we find a totally different German word, „Leben“ – „Life“. And it is a life hidden in a fog of feelings and memories that is exactly what makes up our trilogy of graphic novels, „Alois Nebel“. The title is also the name of our main protagonist, a train dispatcher in his fifties, but still in many ways and adolescent, who works at Bily Potok, a small depot, lost in the mountains. „Alois Nebel“ came to be in the year 2003, when the first book of the graphic novel, „Bily Potok“, came out. Two more followed, „Central Station“ (2004) and „Zlate Hory“ (2005). In 2006, the three titles were collected in one volume named after the protagonist. It is from this collection that the story that forms the basis of the screenplay emerged. The storyline is set in the Jesenik mountains in what is today the Czech-Polish border, an area formerly known as the Sudentenland. The illustrator and co-screenwriter of the film, Jaromir 99, comes from this region. The region—and also the world of trains—is both near and dear to the other co-screenwriter and author of the original graphic novels, Jaroslav Rudis. His grandfather, Alois, actually served as a switchman at a station similar to the one in the story both before and after the Second World War. In many ways he was the model upon which the protagonist is based. Hardly any place in Central Europe‘s devastated history of the last hundred years possesses a past with such vehemnece and brutality as the Sudetenland. Orignally part of Czechoslovakia, after the Munich Accord of 1938 it spent seven years incorporated into the Nazi’s Third Reich. After the war, by government decree, so to speak, the entire native German population was expelled. This huge trauma, which is still felt in the region and which Czech society still has not straightened out, is one of the main themes of the film „Alois Nebel“. The character Nebel is plagued by recurring visions of tragic events and his personal memories of the expulsion. He must try to understand them if he is to find personal peace. The railway, for which he works, represents one of the symbols of Central Europe, something that links it and holds it together. 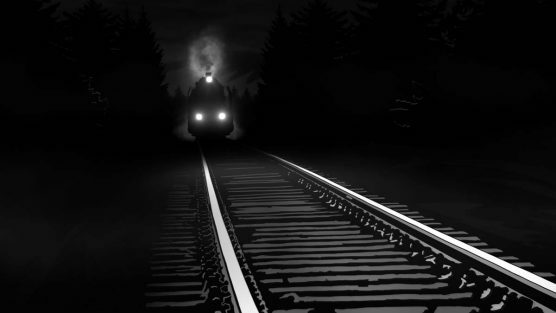 The rail system was a direct witness to, even participant in all the disturbing events of the last hundred years – trains carried millions of soldiers to battles all over the region, transported millions of ordinary citizens to their deaths or into exile—as happened during the expulsion of the Germans from the Sudetenland. The story itself begins in the tumultuous year of 1989 when Czechoslovakia’s Communist regime fell. In this time of social euphoria and enthusiastic chaos the main character, Nebel, experiences his own fall. He finds himself in a madhouse, let go from work, completely at the bottom. He ends up a homeless man at the Central Station in Prague. It is the most beautiful of train stations in Czechoslovakia, and he has dreamed and lionized it all his life, hoping to one day visit it, but never did he suspect he would do so in this fashion. Helping him to regain a sense of balance is the middle-aged toilet-custodian of the station, Kveta. Nebel falls in lover with her, experiencing true love for the first time in his life. It is she who gives him the support he needs to step out of the fog that encircles him and discover peace. 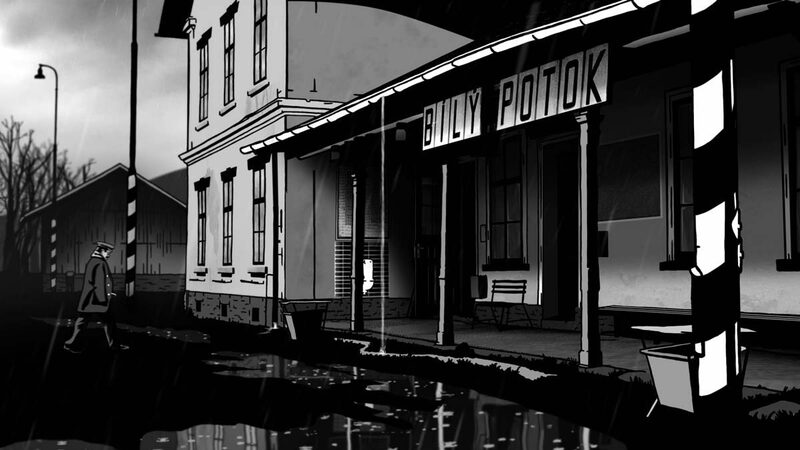 The graphic novel “Alois Nebel” is drawn in a raw, sharp, edgy black-and-white style which sums up the uneasy atmosphere of the time and place. In adopting this approach, Artist Jaromir 99 was inspired by American comics of the 1950s, socialist realism and motifs from traditional paper cutouts which remain a typical form of folk art in the Jesenik mountain area. 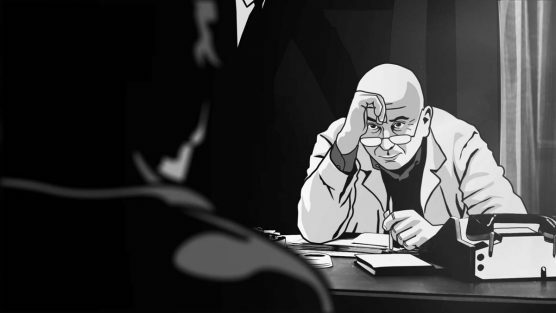 In terms of realizing the graphic novel into a film we deliberated about going with a classical hand-drawn animation approach, aware that it would involve practical difficulties and time-intensiveness, but also deliver a look that would best comply with the aesthetic of original material. We didn’t want to follow the current trend in which most comics are adapted into straightforward live-action films. In the end we settled upon rotoscoping, a form of animation in which the drawing is done over a previously shot image. This technique was initially utilized in the year 1915. At first, the script is shot as if it were a live-action film, with real actors performing in real locations or on real sets. 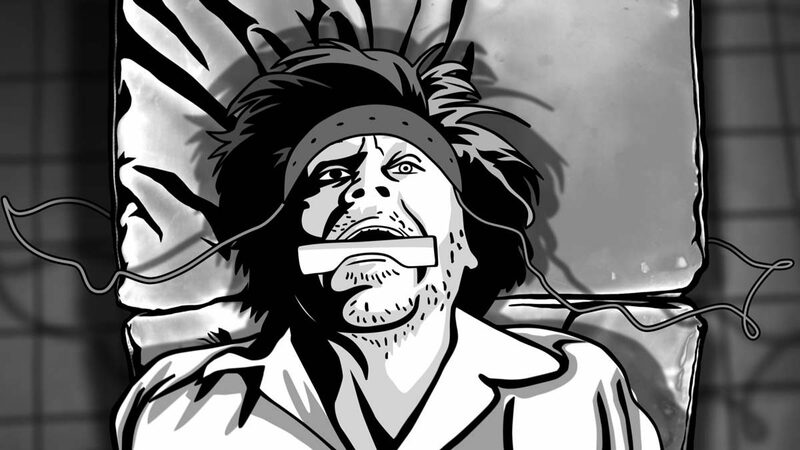 The footage is then thoroughly redrawn. The image that is generated is very similar to a classic hand-drawn animated image, but movement is completely fluid and the facial expressions and general physiognomy of the actors can be maintained. Ultimately, rotoscoping technology comes nearest to our conception of how best to adapt the graphic novel “Alois Nebel ” into a film that remains true to the source material’s form. We will be able to conserve the primary design of the books and, simultaneously, enrich it through the subtleties that live human acting always brings. 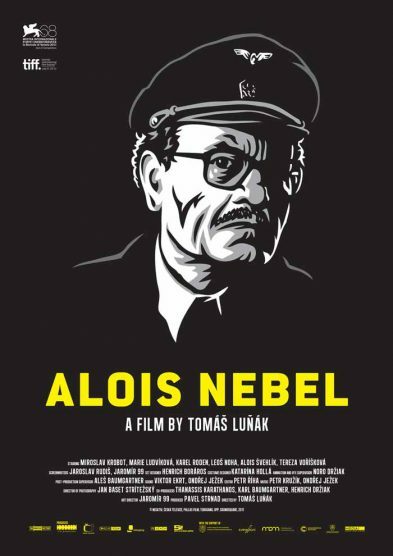 “Alois Nebel” is a film about wandering about, finding one’s way and repeatedly getting lost in the fog of history, about looking for peace and love no matter how late in life one may be. The German word „Nebel“ means „Fog“ in Czech. If read backwards we find a totally different German word, „Leben“ – „Life“. And it is a life hidden in a fog of feelings and memories that is exactly what makes up our trilogy of graphic novels, „Alois Nebel“.